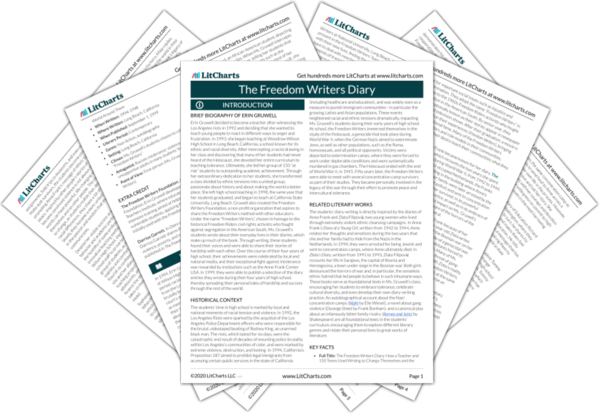 Instant downloads of all 942 LitChart PDFs (including The Freedom Writers Diary). 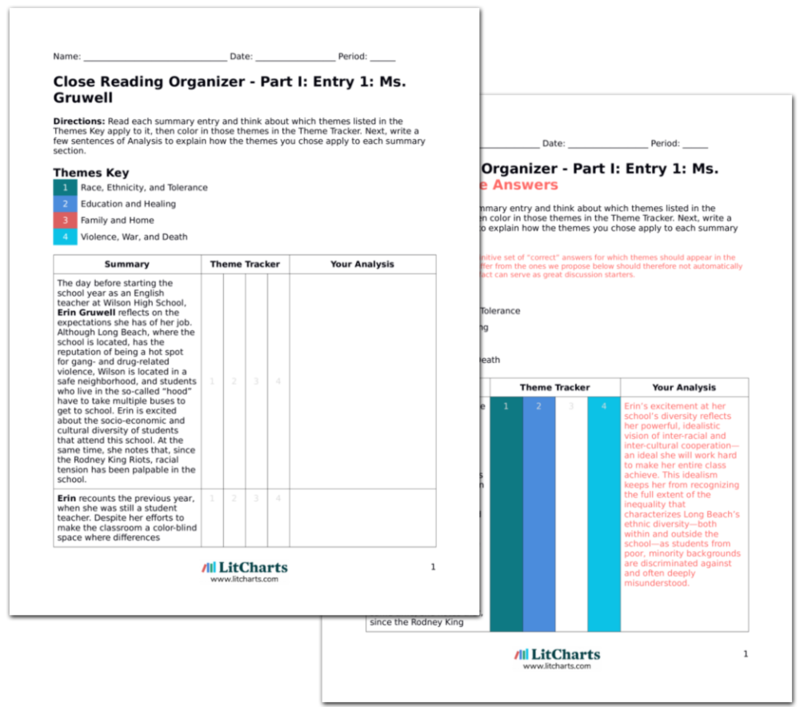 Welcome to the LitCharts study guide on Erin Gruwell's The Freedom Writers Diary. Created by the original team behind SparkNotes, LitCharts are the world's best literature guides. A concise biography of Erin Gruwell plus historical and literary context for The Freedom Writers Diary. A quick-reference summary: The Freedom Writers Diary on a single page. In-depth summary and analysis of every Chapter of The Freedom Writers Diary. Visual theme-tracking, too. Explanations, analysis, and visualizations of The Freedom Writers Diary's themes. The Freedom Writers Diary's important quotes, sortable by theme, character, or Chapter. Description, analysis, and timelines for The Freedom Writers Diary's characters. Explanations of The Freedom Writers Diary's symbols, and tracking of where they appear. Erin Gruwell decided to become a teacher after witnessing the Los Angeles riots in 1992 and deciding that she wanted to teach young people to react in different ways to anger and frustration. In 1993, she began teaching at Woodrow Wilson High School in Long Beach, California, a school known for its ethnic and racial diversity. After intercepting a racist drawing in her class and discovering that many of her students had never heard of the Holocaust, she devoted her entire curriculum to teaching tolerance. Ultimately, she led her group of 150 “at risk” students to outstanding academic achievement. Through her extraordinary dedication to her students, she transformed a class divided by ethnic tensions into a united group, passionate about history and about making the world a better place. She left high school teaching in 1998, the same year that her students graduated, and began to teach at California State University, Long Beach. Gruwell also created the Freedom Writers Foundation, a non-profit organization that aspires to share the Freedom Writers method with other educators. Under the name “Freedom Writers,” chosen in homage to the historical Freedom Riders civil rights activists who fought against segregation in the American South, Ms. Gruwell’s students wrote about their everyday lives in their diaries, which make up much of the book. Through writing, these students found their voices and were able to share their stories of hardship with each other. Over the course of their four years of high school, their achievements were celebrated by local and national media, and their exceptional fight against intolerance was rewarded by institutions such as the Anne Frank Center USA. In 1999, they were able to publish a selection of the diary entries they wrote during their four years of high school, thereby spreading their personal tales of hardship and success through the rest of the world. 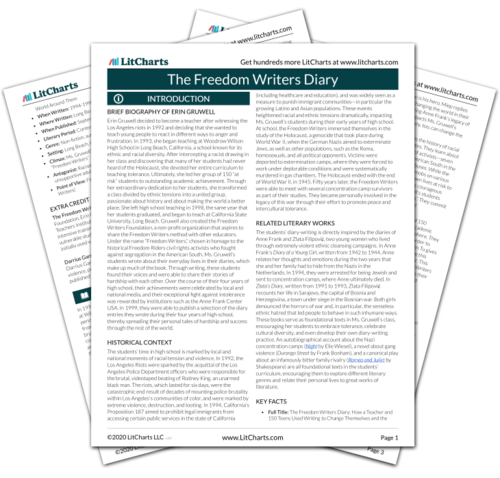 Get the entire The Freedom Writers Diary LitChart as a printable PDF. The students’ time in high school is marked by local and national moments of racial tension and violence. In 1992, the Los Angeles Riots were sparked by the acquittal of the Los Angeles Police Department officers who were responsible for the brutal, videotaped beating of Rodney King, an unarmed black man. The riots, which lasted for six days, were the catastrophic end result of decades of mounting police brutality within Los Angeles’s communities of color, and were marked by extreme violence, destruction, and looting. In 1994, California’s Proposition 187 aimed to prohibit legal immigrants from accessing certain public services in the state of California (including healthcare and education), and was widely seen as a measure to punish immigrant communities—in particular the growing Latino and Asian populations. These events heightened racial and ethnic tensions dramatically, impacting Ms. Gruwell’s students during their early years of high school. At school, the Freedom Writers immersed themselves in the study of the Holocaust, a genocide that took place during World War II, when the German Nazis aimed to exterminate Jews, as well as other populations, such as the Roma, homosexuals, and all political opponents. Victims were deported to extermination camps, where they were forced to work under deplorable conditions and were systematically murdered in gas chambers. The Holocaust ended with the end of World War II, in 1945. Fifty years later, the Freedom Writers were able to meet with several concentration camp survivors as part of their studies. They became personally involved in the legacy of this war through their effort to promote peace and intercultural tolerance. The students’ diary-writing is directly inspired by the diaries of Anne Frank and Zlata Filipović, two young women who lived through extremely violent ethnic cleansing campaigns. In Anne Frank’s Diary of a Young Girl, written from 1942 to 1944, Anne relates her thoughts and emotions during the two years that she and her family had to hide from the Nazis in the Netherlands. In 1994, they were arrested for being Jewish and sent to concentration camps, where Anne ultimately died. In Zlata’s Diary, written from 1991 to 1993, Zlata Filipović recounts her life in Sarajevo, the capital of Bosnia and Herzegovina, a town under siege in the Bosnian war. Both girls denounced the horrors of war and, in particular, the senseless ethnic hatred that led people to behave in such inhumane ways. These books serve as foundational texts in Ms. Gruwell’s class, encouraging her students to embrace tolerance, celebrate cultural diversity, and even develop their own diary-writing practice. An autobiographical account about the Nazi concentration camps (Night by Elie Wiesel), a novel about gang violence (Durango Street by Frank Bonham), and a canonical play about an infamously bitter family rivalry (Romeo and Juliet by Shakespeare) are all foundational texts in the students’ curriculum, encouraging them to explore different literary genres and relate their personal lives to great works of literature. The Freedom Writers Foundation. At the Freedom Writers Foundation, Erin Gruwell developed the Freedom Writer Teachers Institute, where educators can receive a five-day intensive training aimed at helping them teach at-risk and vulnerable students, applying the same techniques that Erin initially used with the Freedom Writers. Darrius Garrett. In Diary of a Freedom Writer, Freedom Writer Darrius Garrett shares the entirety of his personal story of violence, poverty, and success, expanding on the entries he first published in The Freedom Writers Diaries. Legros, Christine. "The Freedom Writers Diary." LitCharts. LitCharts LLC, 30 May 2018. Web. 20 Apr 2019. Legros, Christine. "The Freedom Writers Diary." LitCharts LLC, May 30, 2018. Retrieved April 20, 2019. https://www.litcharts.com/lit/the-freedom-writers-diary.